One Imgur user posted this picture (shown here) showing how you can protect your car and keep it dry when floods threaten your residence. In fact, did you know that Model S can float anyway? Elon Musk in June 19 of 2016 tweeted about this and said the following. "We *def* don't recommended this, but Model S floats well enough to turn it into a boat for short periods of time. Thrust via wheel rotation." It looks like this Model S has been wrapped in a plastic bag before the flood. If the bag is watertight at least on the bottom it can keep the car from being flooded and the car would float in the water. We read so many reports these days of nearly half a million cars being flooded or damaged in Texas due to hurricane Harvey. This is where a flood bags for cars come very handy. This is a great idea especially if you live in an area that floods. And there are options available. One of them is Extreme Vehicle Protection (EVP), which was even seen on Shark Tank. On it's website it reads that "EVP is the first product of its kind offering storage and vehicle flood damage prevention. With protection from 24 to 36 inches of rising tide and floodwaters, it is designed to keep your car, powersport vehicle, and outdoor furniture safe when the weather threatens your valuable property. Designed for ease of use and can be quickly setup in under 10 minutes with 2 people. Simply choose your vehicle size from our ordering page and start protecting your vehicle today." The company's patent is pending. Here is a short video how it works. Some people say this Model S is not floating because of several reasons, like wheel being intact (although it's hard to see). What do you think? I also think it would be great if Tesla or other car makers also offered a bag like this with the car, just like windshields come with any car. The car is floating. 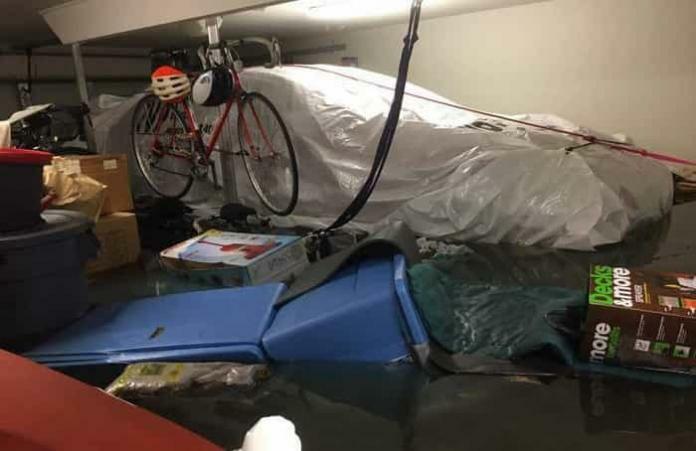 If it were not floating, it would be too high to fit under the garage door (seen closed in the background), and the garage would only have about a 6 foot ceiling.